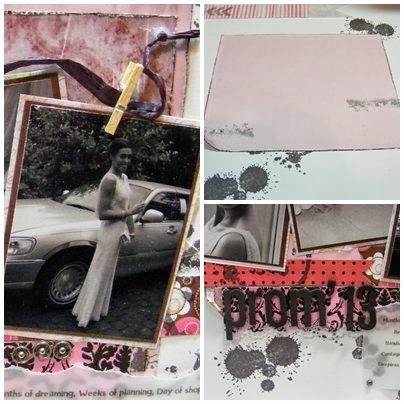 Over at Sketchabilities is scrapbook project #101. I have chosen the theme of my daughters Prom this year and printed photos in black and white to compliment the colour swatch of pinks and browns. I firstly got a lot of scrap pieces of patterned cardstock and cut strips, ‘grunging’ some of the edges with a Tim Holz edging tool. Then got out my Bo Bunny, Hot off the Press and Paper Artsy background stamps and used London Fog and Espresso Truffle memento ink to stamp with. I followed the sketch (with a little of my own interpretation of course) and for embellishments used little pegs, purple raffia paper, felt letters, press studs, and a bobbin reel. ← Cat and a hot Pumpkin…. Awesome page! Love the splatters and colors! Thanks for playing along w/sketch #101 at sketchabilities! Very artsy page! I really love the splatters. Thank you for playing with us at Sketchabilities. Very beautiful, cool mix of colours and elements. Great to have you play along with us at Sketchabilities.